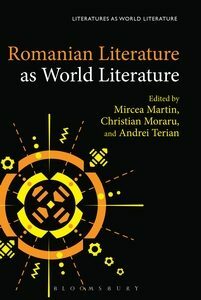 Romanian Literature as World Literature is an essay collection the contributions to which were workshopped at the first edition of the Paltinis Critical Theory Institute, outside the city of Sibiu, Romania, in October 2015, and then coedited by Professor Mircea Martin, Professor Terian, and myself. A world premiere, the book is one of a kind in any number of ways. Given its subject, there is just not anything like this volume out there, no matter how you look at it. But the collection’s uniqueness also stems from the sort of questions the editors and the Institute participants raised. And one of the most important among these questions was: What can critics do present effectively Romanian literature to the world? The keyword here is, of course, presentation. Or, if you will, criticism as a 21st-century art of presentation, of making known and otherwise drawing contemporary international audiences—in particular other critics, but not only specialized publics—to this little-known entity called Romanian literature. What I am talking about is, of course, methodology, first and foremost. But methodology is never innocent, politically and otherwise, and I will get to that momentarily. I am also talking about a more general manner and venue of presentation, from language, audience, and publication arena to tactical—or just practical—ways of engaging readerships who may not know a whole lot about Romanian literature and in general those others whom we often ignore as we talk about ourselves to the world. So I am not referring to what the government agencies or business should do, even though I am really thankful to our colleagues from the Romanian Cultural Institute and our Waterstones gracious hosts for this opportunity. Nor am I worried about translation, and I am not concerned about how few people in the world read Romanian either, about Romania’s ability to push its literature into culturally oversaturated world markets, to overcome the global competition for international attention, and so forth. All of this matters, of course, and it is touched on in the book. But none of this makes up to the volume’s main thrust. So let us imagine, we said back in 2015, that it would be up to the critics—to the criticism they write or should write, to how they present themselves as they present their subject matter—that it would be up to them, then, to introduce Romanian literature to a world that has reached a point where self-described “marginal” cultures have become of real, post-exotic interest. What would make such an introduction successful, perhaps memorable, and by the same token possibly a sea-change in Romanian criticism? I would suggest to you that, in the book’s introduction, preface, and 15 essays, our collective answer was the right one—the right answer to the right question at this juncture in world intellectual history, when critics and humanists worldwide are asking themselves a certain set of questions. Specifically, our response and the book itself eventually had to do with a certain way of intervening in a major, ongoing conversation in 21st-century criticism and theory and even in debates outside the study of literature in hopes, among other things, of drawing scholars who may be interested, if not in Romanian literature per se, then at least in the broader, critical-theoretical issues with which we engage head-on across Romanian Literature as World Literature. Our book appeared in Bloomsbury’s series “Literatures as World Literature,” and the name is relevant for the volume’s overall approach and disciplinary affiliation, World Literature. This is, very simply speaking, the latest metamorphosis of Comparative Literature. It is, of course, well known that one of the defining developments in the literary humanities since the end of the Cold War as a direct result of the expansion of globalization scholarship into the new millennium across and beyond the by now “classical” postcolonial model of inquiry has been the transformation of the study of national literatures. What does this mean? On the one hand, and most fundamentally, this study has gone increasingly comparative. Accordingly, formations of nationhood—whether we talk about the nation-state, national constructions of gender and ethnicity, or literature—have been increasingly reexamined within a world framework, and these reassessments have been theorized usually with some help from Immanuel Wallerstein’s world-systems theory, Pascale Casanova’s world republic of letters, and so forth. The “worlding” of our literary disciplines and individual endeavors, their coming together in the world arena, is one of the most consequential processes marking the latest two decades, and that this process is, for Comparative Literature, abundantly documented in the 2017 equivalent of the “Bernheimer Report,” that is, in the “Heise Report,” whose official title is Futures of Comparative Literature: ACLA State of the Discipline Report, edited by Ursula Heise and published by Routledge last year. One the other hand, the new, World Literature avatar of Comparative Literature—doing, say, Comparative American Studies, of Comparative Romanian Studies with a World Literature twist—has proved in the work of some of its practitioners illuminating, indeed, empowering both epistemologically and politically. In other words, the critical paradigm I am talking about has allowed not only for new readings of whole national traditions and individual authors’ bodies of work but also for the repositioning of these—or some of these—patrimonies on the world map of literary values in a less hierarchical, more non-hegemonic fashion. A new literary world order seems now possible, beyond utopias and Polyannaish daydreaming. A substantial presence in this axiological makeup of the planet is also available to literatures such as Romanian. It is just that you have to make a strong case for it. Making this very case is the overall objective of our book. In this sense, Romanian Literature as World Literature is a collective, critical-theoretical and political manifesto by 16 authors. They are, for the most part, members of Professor Terian’s generation. I think they mark, together, an important moment in Romanian intellectual history apropos of the international developments recent Romanian arts and letters have been in dialogue with: to my mind, this is the first series of critics that, as a generation, are entirely and originally coeval with major, trend-setting changes in critical theory. With them, in their individual works and now in this book, Romanian critical culture stops obsessing about catching up—getting “synchronic,” as the term used to be—with hubs of critical-theoretical innovation like Paris and U. S. campuses and movements such as structuralism, poststructuralism, cultural studies, and so on. This is because these critics have gotten past the point where the priority, for various reasons, is, or was, keeping up with the latest trend or fad. To paraphrase American writer John Barth, these critics have the last half of century, intellectually speaking, under their belt, not on their back. Therefore, they are now in a “post-epigonic” position to effectuate creative interventions of equal footing in the recent conversation about world literature and the much-needed critique of “methodological nationalism.” And they do so, in the book, in ways that are not only relevant and potentially foundational for a new way to understand and study Romanian literature, but also susceptible to move this debate forward and make their take on Romanian literature significant for the reading of other national literatures, for Comparative Literature, World Literature, and literary and cultural theory broadly. These critics are: Andrei Terian, Bogdan Crețu, Caius Dobrescu, Alex Goldiş, Carmen Muşat, Mircea A. Diaconu, Imre József Balázs, Ovidiu Morar, Paul Cernat, Mihai Iovănel, Mircea Martin, Bogdan Ștefănescu, Teodora Dumitru, Doris Mironescu, and Mihaela Ursa. As a whole, their contributions can be summed up as an answer to another important question: Is Romanian literature a world literature? Their answer is affirmative, with the proviso—as the editors say in the book’s Preface—that the ways in which a literature participates in, and actually fosters, a world and acquires a certain presence and stature in it are no longer a foregone conclusion, a given, or a function of that literature’s historically privileged or underprivileged position in a hierarchically organized and economically-politically constituted literary world-system. Loose at it may be, the system does exist . . . But we think we have reached a moment in the history of the world, world literature, and literary criticism where the case for the place, value, and interpretation traditionally assigned to various aspects and segments of world literary practices in the world qua world can be remade, whether we talk about individual writers or about a set of works, styles, genres, movements, or literary units known as “national”—be they Romanian, German, or U. S.
What counts, of course, is the strength of the case—again, how effectively we present ourselves. The proof is in the pudding, so all we can hope is that the book will be read, used, and judged. Not only do we think this is a work of reference. But it is the only reference resource, we argue, that introduces, in a twenty-first-century language—not just English but also a certain methodology and rhetoric of presentation—Romanian literature to twenty-first-century world audiences. It does so polemically, which is why we describe this book as a manifesto. And it is one insofar as the presentation in question is inevitably positioning itself against the nationalist modality of reading national literature in Romania and elsewhere. This sort of reading is still—anachronistically yet aggressively—dominant, perhaps more so in Romania than elsewhere. Hence the urgency, we argue, of drawing from certain interpretations models less wedded to the now obsolete Romantic fantasy of territorialist-organicist culture. The latter, we also suggest, undermines the presentation, the critic’s performance on a stage inescapably bigger than the residential jurisdiction of said fantasy, rendering mainstream criticism an outdated in-joke on otherwise very serious subjects: Caragiale, father and son, as top-shelf authors of the planet’s Library of Babel; the Romanian “Targoviste School” as a cluster of writers connected to and originally feeding into the post-World War II webs of metaliterature, autofiction, and magical realism; the young writers of the 1980s as members of the supranational postmodern sodality; Romanian Literature as World Literature. This is the slightly modified text of an intervention at a book launch organized in conjunction with the London Book Fair by the Romanian Cultural Institute of London and Waterstones (Gower St.) on April 10, 2018. Watch the event here. Christian Moraru is Class of 1949 Distinguished Professor in the Humanities and Professor of English at University of North Carolina, Greensboro, USA. He is the author and editor of a number of books, including Cosmodernism: American Narrative, Late Globalization, and the New Cultural Imaginary(2011) and Reading for the Planet: Toward a Geomethodology (2015) and essay collections such as Postcommunism, Postmodernism, and the Global Imagination (2009) and The Planetary Turn: Relationality and Geoaesthetics in the Twenty-First Century (2015, with Amy J. Elias). His latest book, Romanian Literature as World Literature, is now available from Bloomsbury.